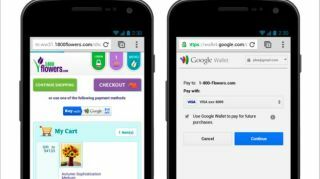 The evolution of Google Wallet continued Thursday as Google announced plans to change the way consumers purchase goods through the mobile web. Instead of being required to fill out lengthy order forms on a smartphone or tablet screen, Google Wallet users can now press one button to have all the busy work taken care of by the service. Consumers with a Google Wallet account can also use the new "Buy with Google Wallet" button for one-touch ordering. Currently, Google's research showed 97 percent of customers who attempt to buy goods through a mobile website quit before the order is complete. By simplifying the process, Google is hoping more shoppers can get the items they want with little to no hassle. Since the program is so new, very few mobile sites have adopted the "Buy with Google Wallet" button. 1-800-Flowers.com, Rockport.com and FiveGuys.com have already implemented the new Google Wallet options into each company's respective mobile sites, and Google promises more (like Finish Line and MovieTickets.com) mobile sites will soon be compatible. This is a pretty big step for Google Wallet, as it now provides a distinct advantage competitor services Apple Passbook and Microsoft Wallet don't yet offer. Google also has an advantage in that its service works across a variety of platforms, whereas Microsoft Wallet is limited to Windows Phone 8 and Passbook is limited to devices running iOS 6. With more and more consumers adopting digital wallets and payment options, it will be interesting to see how the wallet wars continue to escalate over the course of the next year.